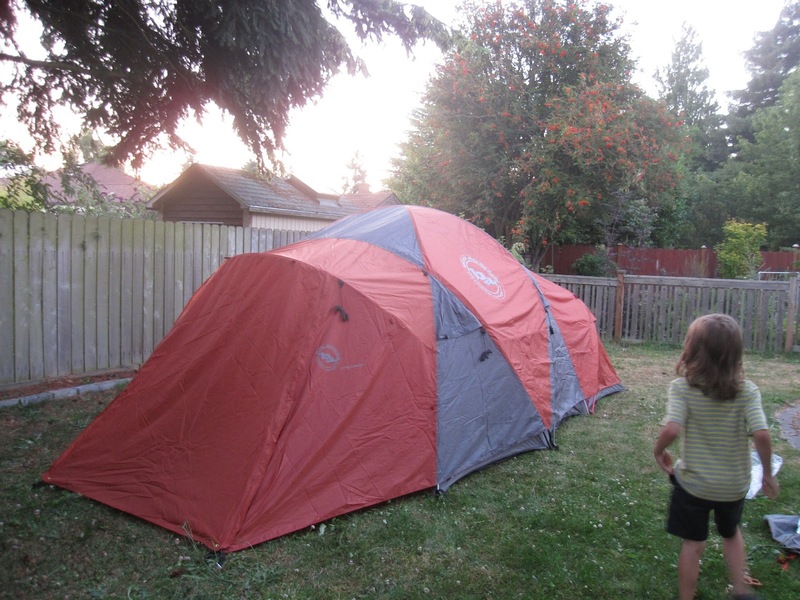 We finally got around to purchasing our first tent. 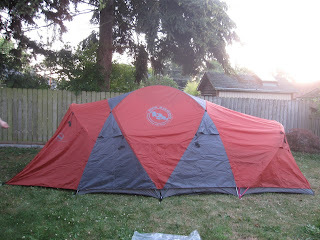 After some research, I decided we should go with the Big Agnes Flying Diamond 6. Aluminum poles and several good reviews on retail and forum sites, the lower profile is apparently better in windy conditions and it splits into two rooms, which Gareth is very excited about. With the rainfly on you also get a small vestibule at the front entrance, good for leaving shoes and whatnot. After Malcolm went to bed last night we let Gareth stay up and help us set it up in the back yard. Pretty easy set up. Gareth enjoyed helping put the poles together and push the stakes into the ground. We didn't bother with the guy lines since we were just going to take it down again. And then Gareth was overcome with giddiness when we let him play inside the tent for a bit. Excited to have a room in the tent that will be just for him and Malcolm (I threatened to keep the small room for myself and make the boys share the big room, which he protested against loudly). He was devastated when we told him he could not sleep in the tent last night, that we were going to put it away. Of course, his sleeping bag isn't clean, and Ryan and I still need to purchase bags for us. But I think once we get those purchased that'll be the last big item we absolutely must have before we can really use the tent. Of course, considering how long it took us to get the tent purchased (I decided which kind to get months ago), it could be next spring or summer before we actually go camping. Looks good. Hope you have many fun camping adventures!